This post should have been called, "An Ocean Behind #3 (to Madagascar) because that is where we we originally going, but we are nothing if not flexible ... Anyway, when we left Cocos we had two routes to South Africa - either north of Madagascar or south of it. The classical, and shorter, route is to go south, with stops at one or more of the islands along the way - Rodrigues, Mauritius, and/or Reunion. This route does expose you to some pretty nasty connections, in particular west of Reunion. Going north of Madagascar and down the Mozambique Channel should give you lighter winds but it is a longer passage. Until that last several years few yachts went this way because the government of Madagascar was not welcoming and corruption among the officials you had to deal with was rampant. Both situations have improved with the government encouraging tourism and (most) officials not expecting or asking for 'gifts'. When we left Cocos our intention was to go about 2800 miles to the northern tip of Madagascar. This turned out to be exactly downwind and we mostly used just a poled out jib. In spite of a bit of helping current and good winds (15 to 25 knots), our progress was not wonderful (112 to 140 mile days) and we had an uncomfortable roll most of the time. We (the captain tends to employ the royal we at times) decided to change our strategy and head south. The change in course was only seven degrees but it made a huge difference to our speed and comfort. Our next nine days ranged from 150 to 174 miles and ride was much more comfortable, even with swells building to the 12 to 15 foot range at times. 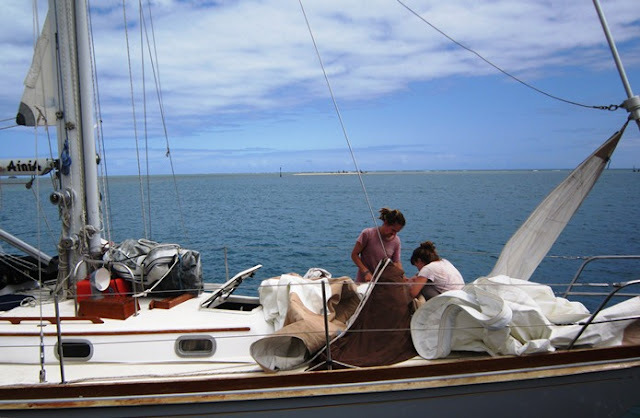 For the entire passage (2016 miles) we motored for a total of 4 hours - 2 hours getting out and away from Cocos and 2 hours getting into the harbour at Rodrigues. We really have to give the Indian Ocean credit, it is a wonderful place if you like to sail. 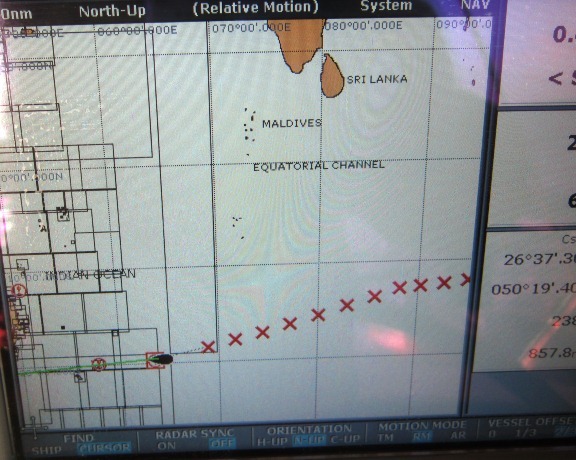 The 'X' marks on the chart are our daily posiotions on the way to Rodrigues (where the boat icon is - Mauritius and Reunion lie to the west as shown). You can see that we started out heading further north for the first four days before veering about 7 degrees to the south. Note that for long passages like this that are basically east to west the shortest distance, the 'great circle route' does not appear as a straight line. Even though we going almost directly westward along 12S we would have gone almost to 13S before heading back to 12S. Rodrigues Island is a semi-autonomous territory within Mauritius. It has a population of about 37,000 and basically no source of income other than that that flows from its wealthier neighbour. This is actually a bit amusing because there is a strong independence sentiment on the island - people feel that they would do better if they were not part of Mauritius. Indeed, when the referendum was held over whether to become independent or stay a British colony, Rodrigues voted to remain a colony while those on Mauritius, which has many more people wanted to be independent - and it was an all or nothing vote, so Rodrigians (or whatever they are called) became reluctant citizens of Mauritius. One shop owner we talked to, who has relatives on the very rich island of Reunion (overseas French department), said that if they were independent they could join France, "because the French really like us". Speaking of France and Britain, Mauritius and Rodrigues were French until 1814 when they became British (earlier they had been Portugese (the name Rodrigues is Portugese) and Dutch (Mauritius comes from the Dutch). There were African slaves here to work the cane fields and after slavery ended huge numbers of Indian indentured workers arrived. As a result the population is very diverse. In spite of two centuries of Britishness and the fact that English is the official language, most people speak a type of French Creole. In schools, the language of instruction is French, but written work is done in English - go figure. Hence many people do not speak English well, but can read and write it fluently. In any case, the baguettes here are cheap and tasty, although shorter and wider than Napoleon's original. Rodrigues is a very pleasant, somewhat sleepy place. This is a major street at a busy time fo the year. At Rodrigues we had to do some sail repairs to the jib as stitching along the foot had just worn away. Here Kristian and Wynne take their turn at it. It is a slow process to replace hundreds of tiny stitches by hand. We have a sewing machine onboard but it is not up to penetrating several layers of cloth. Have to give North Sails a lot of credit for this sail. It has been up for more than 20,000 miles, often in winds stronger than it was designed for. The cloth is still strong and the sail shape is not bad. There have just been wear and tear issues, for example, chafe of stitching when the sail is partly furled. It was repaired in Brisbane and again in South Africa. Touch wood, it should complete the circumnavigation still in decent shape. Posted by Bruce at 1:16 p.m.